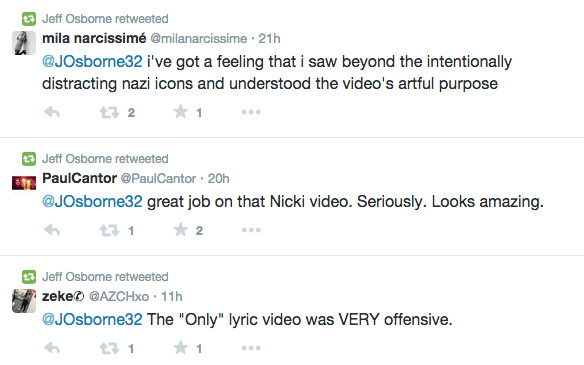 Nicki Minaj just released her new lyric music video for “Only” on Friday, and it is already receiving tons of criticism for resembling cartoonish Nazi propaganda. “The irony should be lost on no one that this video debuted on the 76th anniversary of Kristallnacht, the ‘night of broken glass’ pogrom that signaled the beginning of the Final Solution and the Holocaust,” added ADL National Director Abraham H. Foxman. 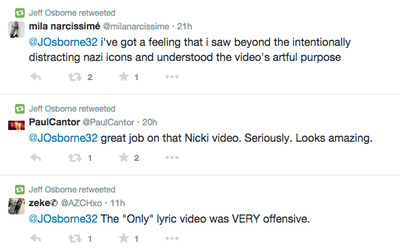 @NICKIMINAJ I’m really disappointed in your use of nazi imagery in “only.” It’s grossly offensive. Please apologise and delete it.